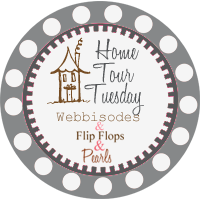 I am linking up with Flip Flop and Pearls for Home Tour Tuesday. . . This week is The Office. . . we have put work into mine, but it is still a work in progress. I have shared "what's on my desk" but I have not done the "reveal" on my room because in my mind, it's not "done" yet. We still have a couple of things left to do, but I thought I would share some preliminary pictures with you. I spend a HUGE part of my days and week in here. Today, calls started at 7:10 am and I did not hang up until 5:00 and went through all three handset of my hardline, had a total of 13 minutes off between one call, and was not able to shower or make the bed until after my last call. Here are some before pictures. . . The things that I really didn't like about, the light, hate that light, but I still have not found a new one. Hate the dark trim and doors. So, we picked out a new color for the walls that was all me, Antique Pearl, I love it. Next the boy painted the doors and trim a nice crisp white. I added some blinds that I love and some Tar-jay curtains and adorable bow tie-backs from Urban Outfitters. It still has a LONG way to go, but for now, it is serving is purpose and I am pretty effective and productive out of here. Still have a LONG way to go, and the picture right above was an in-progress but it is the best one I have of the curtains at the moment. I still need to go through my bookshelf and clean up my cords and do some organizing. But it is getting there. I also still have two chairs that need to be covered. I have a list though, just need to get a couple of things crossed off. But for right now, it is a great work environment and a great place to blog from! The office is looking great. Our plans are on hold thanks to Uncle Sam. We are sending him the money instead. Oh well. Looks like you're well on your way to a great room! 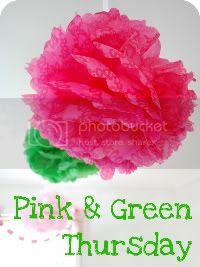 I love the green lamps! Where did you get those green lamps... ADORABLE!